Spring fever is in the air! This March, we’re excited to announce that we’re launching the new Spring Forward Math Toolkit, a free resource to help solidify learning in math and energize the students in your school. This spring toolkit focuses on some innovative ways to use TenMarks, in addition to external resources to nurture a culture of growth mindset in classrooms across your school. The Spring Forward Math Toolkit, inspired by teachers, provides tips and strategies for grades 1 – Algebra 2, so it’s versatile across the grade levels. From worksheets to lesson planning ideas and teacher guides, you’ll be sure to find the math resources you need to keep your class engaged for the remainder of the school year and beyond. Please note that the Spring Forward toolkit enables you to mix and match different resources, and use the lessons and activities that you find most meaningful in your classroom. Ideas to motivate, celebrate, and build confidence in math. and more! By completing the full Spring Forward Math Toolkit with your students, you can also award them with this certificate exclusively from Amazon Education. This spring toolkit was inspired by teachers Dustin Ecker (MSD Warren Township, IN) and Amy Filiaga (Weber SD, UT). 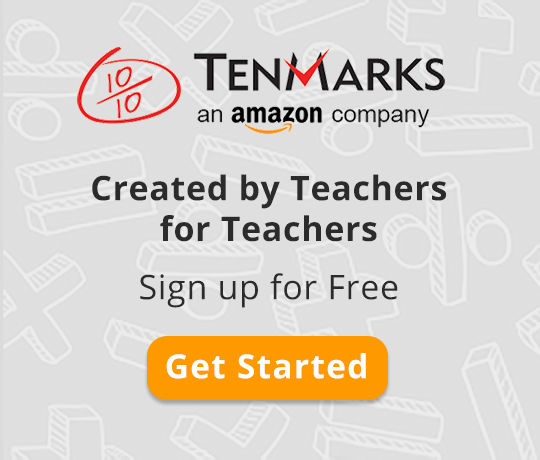 How did these teachers motivate students to complete TenMarks math problems? As we interviewed both teachers, we captured a few strategies and turned them into a menu of activities for you to try with your own students. Domain Booster was designed from Ms. Filiaga’s wise words, “Students who continue to struggle in math often times are highly motivated when they first begin to have success. Success leads to a new confidence boost, and that feeling of excitement becomes addictive!” See how you can help struggling students begin to have that success with the Domain Booster Teacher Guide. Mistake Mondays originates from another practice in Ms. Filiaga’s classroom. She shared with us, “It is absolutely okay to make mistakes. In my class, we make mistakes together.” The Mistake Mondays Teacher Guide is designed for teachers who want simple and effective ways for students to approach math with a growth mindset. Both Ms. Filiaga’s and Mr. Ecker’s students used TenMarks monsters to monitor progress. “I want my kids to know, ‘This monster means I’m working on Geometry, or, I’m working on Number Sense”, Mr. Ecker explained. Ms. Filiaga agreed that some students are motivated by more visual cues: “Remind students how they can level up monsters and win accessories!” she urged. Monster Motivators is just one activity of many in the Spring Forward Toolkit to motivate your own students. “Remember when this was hard?” Ms. Filiaga says to her students after practicing a unit, “It was hard at first, but with practice, you get better.” Like Ms. Filiaga, you can use the Math Tracker Teacher Guide in the Spring Forward Toolkit to help students make goals for themselves and track their progress towards accomplishing them. Students will be amazed by what they can achieve! *An Amplifier is a mini-lesson that is automatically assigned to students when they score less than a 70% on an assignment.